Track your tasks and projects with these open source organization tools. Jeff Lasovski. Modified by Opensource.com. CC BY-SA 3.0. No, I use an open source alternative. No, I don't use any similar tool. I have to admit, I've fallen in love with Trello as a productivity tool. If you like keeping lists as a way to organize your work, it's a very good tool. For me, it serves two primary purposes: keeping a GTD framework, and managing certain projects with a kanban-like schedule. But Trello is a closed source SaaS product, and I wanted to know whether I could find an open source alternative to meet my needs. As much as I love Trello, it lacks a few features that I'd really like to have in a list/task manager, and I wanted to explore my other options. If you're not familiar with Trello or the concept of a kanban board, it's pretty simple. Items on a list are each treated as "cards." Offline versions often use Post-It Notes moved across a series of bins. It's based on a process developed for manufacturing, but widely adopted by the lean software development community. Cards might represent a feature, which is moved across a board to represent its flow through development, review, testing, and deployment. Digital tools often allow attachments to these cards: images, links, additional lists, a person assigned to the task, etc., and many have additional tools for giving you a fuller picture of how tasks are moving across a workflow. For people with a lot of production-oriented work, they also work well outside of the software development world. I use kanban boards for tracking everything from articles being written to home repairs. First up is Taiga.io. We've reviewed Taiga before, and it's one of our top project management tools. Whereas some project management tools seem to focus too much on including a kitchen sink of features, one of the things that I liked about Taiga when I first learned about it was its focus on simplicity and a clean interface. Taiga is also highly customizable and includes integration with a lot of other features and external tools, as well as a number of community-created tools. Taiga does more than kanban boards, but since that's what I am primarily interested in, that's most of what I explored. I liked the ability to add custom fields, and the points system is something that teams might find interesting; reporting was also super easy. In addition to being an open source project you can download and run yourself, Taiga features an online hosted version. Public project boards are free, while private boards can be hosted for a small fee. Taiga is written in Python with Django and on top of AngularJS, and is open source under a GNU Affero GPL. 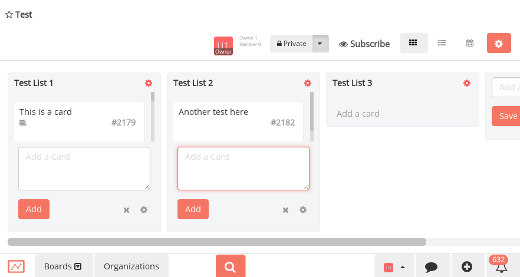 Kanboard is a fairly minimalist entry into the world of open source kanban boards. But don't let the minimal interface fool you, it still hosts a number of features including task searching and filtering, subtasks, attachments, commenting, and more, as well as some decent analytics and reporting options. You can also easily export your cards in a variety of formats. Kanboard is easy to install, uses few resources (you can run it on a Raspberry Pi, for example), and has been translated to quite a number of different languages. The next contender I looked at was Wekan. Wekan was formerly known as Libreboard, although the project has evolved significantly from this previous version. They have a free hosted demo that you can try out, or you can download and install it yourself. They make this especially easy, providing a container image, VirtualBox image, or the ability to install from source, and it's integrated into Sandstorm.io if you're already using that platform for hosting a personal cloud server. Libreboard (now Wekan) screenshot by Jason Baker. CC BY-SA 2.0. Restyaboard attempts to pick up where Trello stops and extend the feature set a bit; they've got a handy comparison chart on their website which lays out their additional features pretty well. Their online demo shows off many of these features. If you're already using Trello, you'll appreciate the ability to import your tasks directly from Trello's default format so you can get up and going quickly. 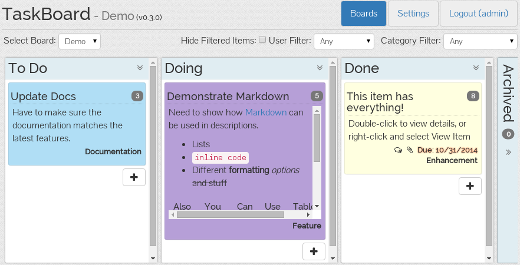 What I appreciated about Restyaboard was the templating feature (something my currently solution is lacking). They also have a handy API explorer, which makes custom integrations with other tools a breeze, assuming you're willing to do a little bit of coding. The final tool I looked at was TaskBoard. Like the others, TaskBoard also has an online demo you can try out for yourself before you download and install it. I found TaskBoard to have many of the same features of other tools I looked at, and that's certainly not a fault. It's a reasonably full-featured solution with filtering, comments, attachments, and most of the standard features of a kanban board I've come to expect. What I liked most about TaskBoard was its inline support for MarkDown, which has become my go-to format for writing. Do you have another favorite that I missed? Let us know in the comments below, and if you've tried any of these out, tell us what you think! And be sure to also check out our guide to project management tools for agile teams, which has even more great projects to choose from. This article was originally published on August 27, 2015. It has been updated to reflect changes made to a few of the projects originally listed. Trello and all the other tools are good for organization looking for kanban model. But surely they lack in many other features required for sound project management like gantt, reports, templates etc. Well, we're using ProofHub into our organization and it is my favorite tool. It is really helping in increasing productivity at work and also has proven to be the best collaboration tool for us. I don't think it's appropriate here to advertise for closed source alternatives to trello. Or at least, mention that they are closed so I don't waste my time checking the website. Same here. A lot of the suggestion are trying to do search engine optimization and to promote their product/services. I love Taiga.io, the way it looks and how it works and will be doing a Scrumproject with it shortly. There are also Docker-versions of Taiga available!! I noticed that Kanboard can autocreate tasks from emails. That is just awesome. Does anyone know of any open source, Kanban helpdesk application? Hi Jason. You forgot about IC Project (https://icproject.com) It's fantastic tool for projet management with kanban, crm, chat, time tracking. You'll love it! It's being used by a few open source projects (and is itself open source). Quite a nice tool. I use wekan via docker, it's so easy to setup and quite useful (I migrated from Trello after they were bought by Atlassian). The one pain-point for me is that without docker, on computers like the raspberry-pi it's a pain to get it running (I have not managed yet). You should add Bitrix24 on the list. Really good and has cloud and open source versions available. Comes with Gantt, time tracking, client invoicing and other features that aren't available in the tools you've picked for the list. Bitrix looks good ... but if you want the OpenSource version, you have to buy one of their On-Premise editions. God list, trello is great, but is more of a task management than project management, and I trhink you need both to get things rolling. I would also recommend https://alldone.io/ very similar to trello but with build in Scrum support. I think Odoo is another choice. It is an ERP System. It combines with Kanban Concept into all the system. I think https://hitask.com is a great alternative to Trello. My company maintains an open source clone of Pivotal Tracker that is also hosted and free to use : http://central.cm42.io. Check it out. I use Solo. Am open source kanban board http://getsoloapp.com/ Only the self-hosted version and it can be a pain to get the server going on your subdomain. But once you get it going it's a great tool. III. This software can not be redistributed in any form, nor can you sell access to this software." Another great alternative is Kanban Tool (https://kanbantool.com/ ). It's a really smart software that allows you to create multiple boards, share your ideas and files with colleagues and collaborate effectively. One of the biggest advantages is it's simplicity and reliability. I've been working with it for over a year now in my team and I absolutely love it! OMG. There are so many Trello alternatives like Kanbanize (https://kanbanize.com/). The thing is that Trello is not exactly a Kanban solution. Or it is but on a very basic level. I don't really get it. Trello is a simple todo list. Anyway. Good list. Thanks for it. 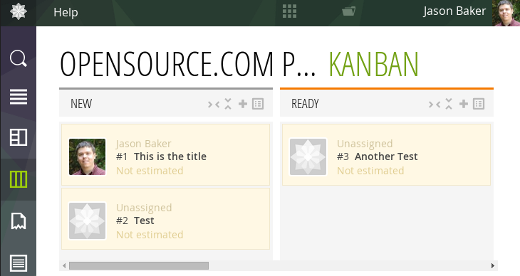 See http://www.kanbanara.com or https://sourceforge.net/projects/kanbanara/ for further information. Did you look at the other tools mentioned? Did you notice how much effort some of them put into a visually pleasant design that allows to focus on the important things? I am sorry to hear you put so much effort into a product that IMHO is just too packed and over-colored to be really useful. If you think the core functions can compete with the other OS tools, please ask a designer to look over your software. One more tool I recommend is FindNerd-Free Project Management Tools (http://projects.findnerd.com/ ) It is currently free which bridges the gap by providing a rich set of features while still allowing the end-user to have the flexibility of using them as per their need. I use Trello for every web development project at my marketing agency, since I can easily add images and instructions for my web developpers to achieve. It is really the best tool that I have used so far to communicate with Web developpers. 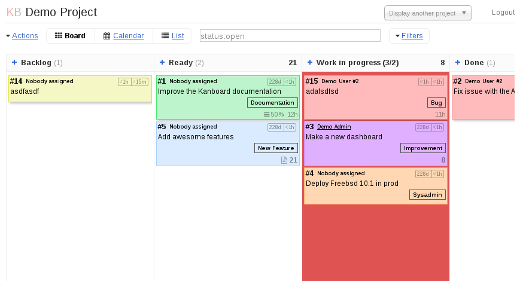 However, for overall project management, I find Trello to be limited for its calendar view. I use Asana instead to manage project in the whole. It's free and helps me a lot in project management. You should add Proggio on the list as well. It's okay if you didn't since it's new and a lot of people haven't heard of it yet. If you want, you can read more about it at https://goo.gl/2S6rAv and perhaps you can add it up to your list. How do you pu you kanban up the website for the public? A lot of the comments are just for SEO purpose. So sad. I use https://kanbantool.com/. There's an option to use it for free (or go for a free trial version if you need a group of more than 2 people to use it). It's easy to use and has useful features, such as analytics and time trackers. I use to use Trello and quite honestly, it took me a long time to figure out how it works. I'm so glad I switched to another tool. The Link to https://wekan.github.io/ has a failure... the : isn't inside and the last 2 / are not needed. Thanks. I'm not sure when that error was introduced, but I've corrected it. Good morning, I would like to understand if there are any tools that support the use of swimlanes as well. I have been playing around with TAIGA and like this - but I cannot find a way to make use of swimlanes inside the KANBAN board. Thanks for any feedback and help - I am looking for an easy to use, open source KANBAN board for a small team of 5-10 people, distributed over various locations. Like to add one more project. This is an open source kanban app creating using vueJS+Express+GraphqL. So invite anyone interested to contribute.